Thanks to modern CAD 2 and 3d systems Bombelli Metaltecnica srl is able both to elaborate renderings supplied by the customer and to develop customized projects based on their needs. The staff working on the design of the products is well qualified and skilled. With its technical office, the company is able to provide expert consulting, supplying planning and productive solutions to satisfy the different request of the customer both in civil and industrial field. The challenging phase of executive planning is monitored by high qualified staff with a strengthened know-how; the development and control are managed with advanced software used for structural calculations concerning the production of metal constructions. After survey in loco and briefing with customers to obtain enough information, qualified staff develop projects according to the customer expectation and needs. 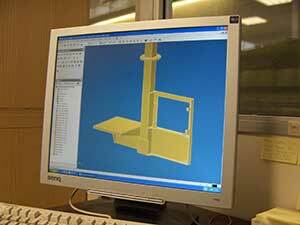 After the project is approved all needed technical specifications and drawings to final manufacturing are minutely developed.